Do you remember your mother or maybe your grandmother saving the grease leftover from cooking bacon or other types of meat? She would have collected it in an old metal coffee can and kept in the refrigerator. Maybe I am dating myself, but I remember that vividly from when I was in elementary school. There was usually a wide-mouth red Folgers coffee can on the top shelf of the refrigerator that my mother poured grease into after cooking bacon on a weekend morning. Collecting bacon grease and meat drippings was a practice that was encouraged during World War II when conservation and rationing of goods was the norm. In 1942, the Disney Studios created a public service announcement (PSA), Out of the Frying Pan and into the Firing Line, which was an incentive film like the income tax pictures and was made for cost. The story showed “the importance of housewives saving waste fats for the purpose of making shells and explosives.” The film was made for the Conservation Division of the War Production Board an agency established by Executive Order 9024 issued by President Roosevelt in January 1942. 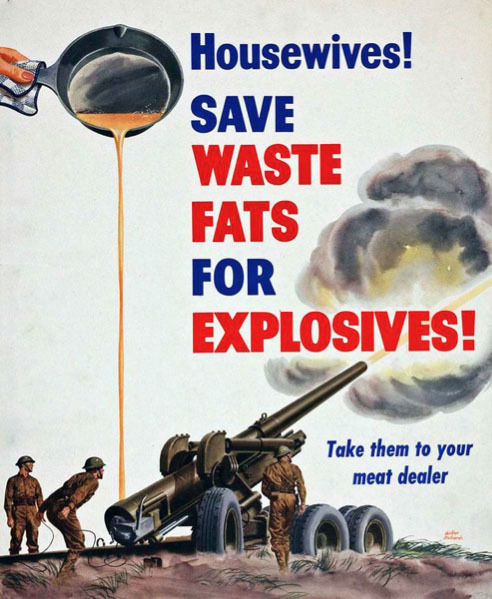 This poster from 1943 emphasizes the importance of housewives playing their part in the war effort by saving leftover waste fats from the kitchen. Waste fats turned in at an official collection station were exchanged for cash, around .04 cents per pound, ration coupons, or meat products; Artist: Walter Richards. 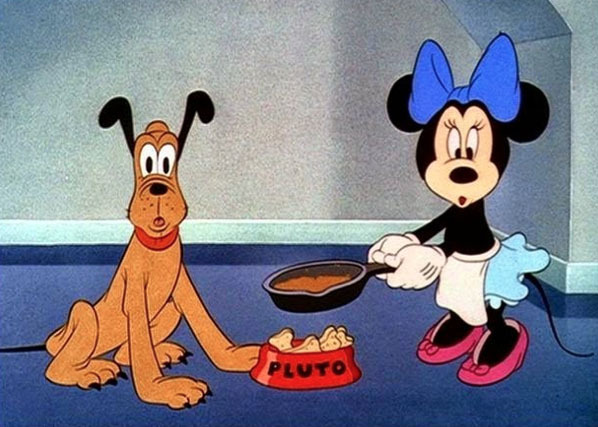 Minnie Mouse starred as the typical all-American housewife doing her part for the war effort and her dog, Pluto. 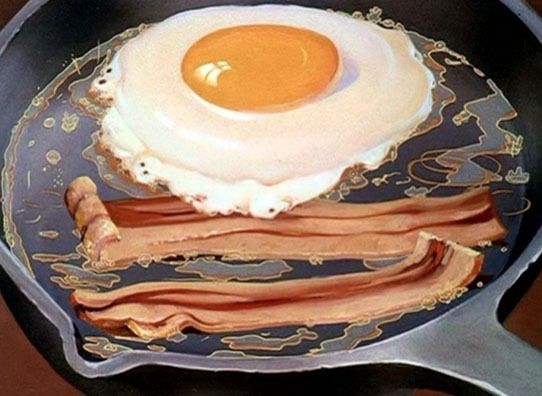 Minnie, at the stove cooking, offers Pluto some bacon drippings but before he delights in the treat, they are interrupted by a radio announcer explaining, “Don’t throw away that bacon grease! Housewives of America, one of the most important things you can do is to save you waste kitchen fats.” The announcer explains that kitchen fats; bacon grease, meat drippings, and frying fats, are needed for munitions to “help win the war.” Waste fats can be distilled to produce glycerine which is used to make explosives. The announcer notes that two billion pounds of waste kitchen fats are thrown away every year, which is enough to make “ten billion rapid fire cannon shells” and “a belt 150,000 miles long, six times around the earth.” He continues by saying that, “a skillet of bacon grease is a little munitions factory.” The animation shows pouring bacon grease dissolving into bombshells and bullets. Pluto is initially disgruntled about not getting his bacon fat but slowly changes his attitude as the radio announcer continues the message, “meat drippings sink axis war ships.” The animation shows fat dropping off a slab of meat cooking and morphing into a bombshell that then sink an Axis ship, which is reused animation from the end of the tax pictures, The New Spirit and The Spirit of ‘43. This is a convincing use of animation to convey an important message that even the simplest daily item saved can make a difference in the war effort. A basket of French fries being lifted out a vat of frying oil is done in limited animation as the announcer says, “waste frying fats speed depth-charges on their way to crush Axis submarines.” Depth-charges are shown firing off the deck of ship and then exploding underwater sinking an Axis sub. Again, this is reused animation that shows up in various war related films produced by Disney and not only helped to keep costs down, but also allowed for these films to be completed with speed. As Pluto listens to the radio, his attitude changes as he realizes every sacrifice helps the soldiers on the frontlines. “Your pound of waste fat will give some boy at the front an extra clip of cartridges,” say the announcer as Pluto gets excited and turns to look off screen left. 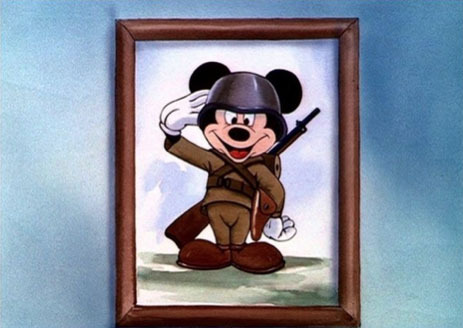 The scene cuts to a framed image of Mickey Mouse saluting in an Army uniform with a helmet on and rifle. This is, I believe, one of the only known official images of Mickey Mouse in a military uniform during the WWII time period. 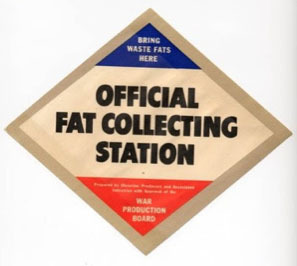 The official fat collection station signage displayed in the local meat dealers window. Minnie asks Pluto if he still wants the bacon grease and he refuses now that he knows it can help “the boys at the front.” He then zips off screen and returns with an empty coffee can as the announcer extolls, “pour your waste kitchen fats in a clean wide-mouth can… that’s right, not a glass jar or paper bag.” The animation and voiceover goes into an instructional section and then dissolves to Pluto balancing the full can of kitchen fats on his nose as he trots off to the local butcher shop. As Pluto approaches the “meat dealer,” he stops to look at the sign in the window—OFFICIAL FAT COLLECTION STATION. Pluto goes into the store and turns in the can in exchange for some wieners. He then proudly walks off with the wieners in his mouth and an American flag waving on the top of his tail. The announcer comes back on to wrap the short up by saying; “Save waste fats to make explosives…look for the official insignia in your meat dealers window,” as the music of ‘My Country ‘Tis of Thee’ plays in the background to button the short with patriotism. 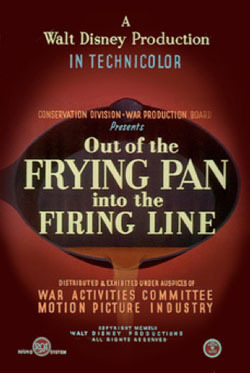 Out of the Frying Pan and into the Firing Line was released to the theaters on July 30, 1942 and was one of the last government commissioned shorts from Disney to use any of the major characters. Although, Donald Duck did reprise his role in the second tax picture, The Spirit of ’43, most of the other PSA films created for government agencies were done simpler and without the well-known characters or using repurposed animation entertainment shorts. Producing these high quality animated shorts like this one was becoming too costly and time consuming for the schedules that these films demanded. The short was directed by Ben Sharpsteen, who also had directed The New Spirit. Pinto Colvig, known as the original voice of Goofy, does the grunting of Pluto and Thelma Boardman is the voice of Minnie Mouse. The animation is credited to John Lounsbery, a Disney Legend and one of the famed Nine Old Men. Lounsbery was known for his Pluto animation and according to Frank Thomas and Ollie Johnston in their book Disney Animation: The Illusion of Life for “some funny observation to lighten the situation.” This is certainly true of Pluto’s expressive reactions throughout this PSA. At the end of WWII, the country converted from a wartime economy back to peacetime. This ended the wartime contracts that helped to keep the Disney Studios afloat during the war. Dumbo and Bambi were both in production prior to the U.S. involvement in WWII and were the only animated features released at the beginning of the war. Aside from the war related PSAs, educational and training films, the Disney Studios were making mostly shorts with some specifically used in what are known as packaged pictures, which are compilations of several shorts similar to Fantasia. The packaged pictures Saludos Amigos and Three Caballeros were the two entertainment films released during the war years. One other feature, Victory Through Airpower, was also released but is considered an animated documentary, which Walt Disney financed. Out of the Frying Pan and into the Firing Line along with other WWII era Disney shorts, notably the Donald Duck tax pictures and others, helped to cement the importance of these characters within the American culture. Donald, Minnie, Pluto, and Mickey, were a mirror of society, working together with the American public to defeat the Axis and help end “the war to end all wars.” These Disney characters were viewed by the public as patriotic and represented American ideals and resourcefulness during difficult times that helped galvanize them as Ambassadors of Goodwill, which they continue to be today. If we stop to think, recycling first came about with warlike purposes. today it is applied to protect the environment. We currently collect fat for the production of soap and cleaning products. Yes, the rationing and recycling was big during WWII and a necessity for the war effort. There is another great cartoon called VICTORY VEHICLES that speaks to recycling and conservation. I was aware of the use of fats for soap and cleaning products. I do think that more people are conscience of recycling now as part of our daily lives and as a necessity to benefit the environment and because it conserves resources. Thanks for reading. Even the UK had similar films produced like “The Dustbin Parade” by Halas & Batchelor…. Do you remember your mother or maybe your grandmother saving the grease leftover from cooking bacon or other types of meat? She would have collected it in an old metal coffee can and kept in the refrigerator. Maybe I am dating myself, but I remember that vividly from when I was in elementary school. What do you mean about dating yourself? A lot of people here where I live still save leftover fat and grease for recycling purposes. Well, my mother no longer saves the fat in coffee can and my millennial’s have never heard of such a thing. I truly don’t even know anyone that saves waste fats anymore. Out here her in Los Angeles, I wouldn’t even know where to bring a can of kitchen fats. Thanks for your note! Guess it depends on where you live. There are a number of drop-off stations collecting used cooking oils and fats here in the northwest where I live. Free-standing tanks you pour it into. In Seattle you can set the stuff out with your curbside recycling and they’ll pick it up. These days they turn it into biodiesel fuel. We’re into recycling up here. Wow, I had no idea. Here in Los Angeles, we do separate out recyclables but nothing for waste fats. I would have mo idea where to take them if I did save them. It certainly does depend on where you live. My late mother used to save fats in mason jars herself. My mother does this, as do I; she says pouring the fat down the drain clogs it, and pouring it into the trashcan makes it stinkier. I never thought to question it. Mildred Bailey had a song in her broadcast repertoire called “Scrap Your Fat”. This takes on an interesting note, as Bailey was a very hefty woman herself. Then, there’s the local radio announcer who solemnly advised. . . . Thanks for reading the column and for this information. Great, informative article! The announcer’s voice is so familiar and unique, would love to know who it was. The narrator is Art Gilmore – who voiced many many trailers in the 1940s and 50s, not to mention the Warner Bros. Joe McDoakes shorts. Once, on a special episode — Red performing a series of pantomime bits, I think — the show began with Art Gilmore in a tuxedo. He introduced himself and there was almost an ovation. He looked a little embarrassed and continued. Kinda sad we never got war themed Mickey Mouse short. That screen shot of Mickey in Uniform is awsome. Also There Was Recycled Animation Of The Whirlpool From The Sorcerer’s Apprentice Segment From Fantasia In This Cartoon. David A. Bossert is an award-winning artist, filmmaker, and author. He worked at The Walt Disney Company for 32-years and contributed his talents to The Little Mermaid, Beauty and the Beast, Aladdin, The Lion King, Pocahontas, Fantasia 2000, Destino among many others and is now an independent producer, creative director, and writer. He is a member of the CalArts Board of Trustees and is a visiting scholar at Carnegie Mellon University’s Entertainment Technology Center (ETC) in Pittsburgh. Bossert is considered an authority and expert on Disney animation history. He co-authored Disney Animated, which was named iPad App of 2013 by Apple and won a prestigious British Academy of Film and Television Arts (BAFTA) Award.